Falcon chicks are fed in a hack box by Shenandoah National Park staff before release into the park. Hacking has successfully established a breeding pair of falcons in the park. Photo by Rolf Gulber (NPS). As part of a national restoration effort, the Center for Conservation Biology along with numerous partners spearheaded a peregrine falcon reintroduction program in Virginia. The program involved the release of captive-reared peregrines with the hope that these birds would re-colonize the historic breeding range. Between 1978 and 1993 approximately 250 young falcons were released in Virginia. Falcons were released into the wild using a management technique referred to as “hacking“. Release efforts were initially focused on the outer coastal fringe. In 1985, the program shifted focus to the mountains. For a description of individual hack sites and a summary of hacking activities, please follow links below. 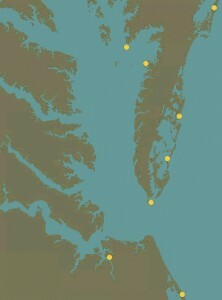 The first releases of captive-reared peregrine falcons in Virginia occurred within the outer coastal plain. This area has a rich prey base for peregrines and it was believed that if a breeding population could be established here, young produced over the years would re-colonize historic breeding locations within the mountains. Over a several year period, a series of towers were erected along the barrier islands for release of young and for breeding. Between 1978 and 1985, 115 young peregrines were released in coastal areas of Virginia. See the Coastal Hacking page for descriptions of hack sites and details of releases within individual sites. Following an eight-year reintroduction program on the Coastal Plain, a second reintroduction effort was initiated in the mountains of Virginia in 1985. The objective of this effort was to establish breeding pairs within the historic range of the peregrine in Virginia. A series of hack sites were established within, or near, mountain sites where it was believed that conditions were suitable for future breeding. Between 1985 and 1993, 130 captive-reared peregrines were released within the mountains. See the Mountain Hacking page for descriptions of hack sites and details of releases within individual sites. Read more about hacking peregrine falcons in Virginia.